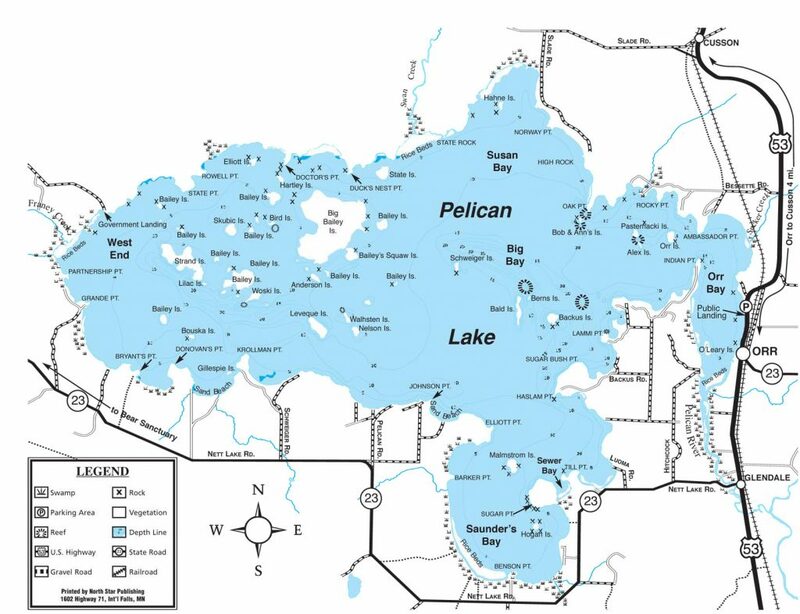 Pelican Lake is 11,000 acres (approximately 7 miles by 3 miles) with 50 islands. Because of it’s complex structure of sand, rock, and variety provides excellent family fishing opportunities as well as the challenge of fishing for trophy bass and the occasional lunker walleye. If you have not fished Pelican Lake in the past, we offer a few general suggestions that may be helpful. Walleyes – Deep water shad Rapalas or heavier jigs tipped with minnows/leeches, seem to be most productive. Small and light is better than big and heavy. Large fish can be landed with medium or even medium light rods and reels. Lighter rods and reels allow for the use of lighter lines (no more than 8 lb. diameter) and smaller lures. Pelican Lake is usually quite clear and, except for northern pike, fish will shy from heavy lines. Northern pike – Weedless or semiweedless lures such as Johnson silver minnow or spinner baits work well. Pike seem to like white and yellow. Use wire leaders. Some folks have success using a bobber with a sucker minnow under it. Bass – Try top water lures on calm evenings. During the day use small crank baits, spinner baits, jigs with tails to fish over reefs. Use weedless lures in lily pads. Panfish – Use small jigs with tails either cast or fished under a bobber or small leeches or wax worms on jigs. Note: All fish, including walleyes, like small to medium leeches. These suggestions are not absolute. Other methods and lures work well also. If you plan on fishing seriously, please feel free to call for the latest information. Time of year can be a factor on suggested equipment. Because Pelican Lake is quite shallow, it offers easy fishing opportunities for a variety of birds including osprey, eagles, loons and of course pelicans. Along the wooded shoreline visitors may see deer, bear, beaver and otter.